Pearson Medical Technologies offers comprehensive solutions to bar code labeling needs so pharmacists and their staff can provide quality service to their patients. m:Print® is a stand-alone software, that allows users to begin the labeling process within minutes of receiving m:Print®. m:Print® Bar Code Labeling Software allows every pharmacy to increase efficiency and accuracy of its unit dose labeling as well as all its manually packaged labels. Because m:Print® is a stand alone software with the ability to label virtually everything in the pharmacy, any pharmacy can instantly become bar code compliant. Not only is it capable of pharmacy labels, m:Print® Bar Code Labeling Software allows you to customize an unlimited number of label templates all for your pharmacy needs, with all drug information and pill images. Now with the added Bar Code Constructor Module, users can now build a bar code on a label template containing data from one or more data fields with custom selected field delimiters. 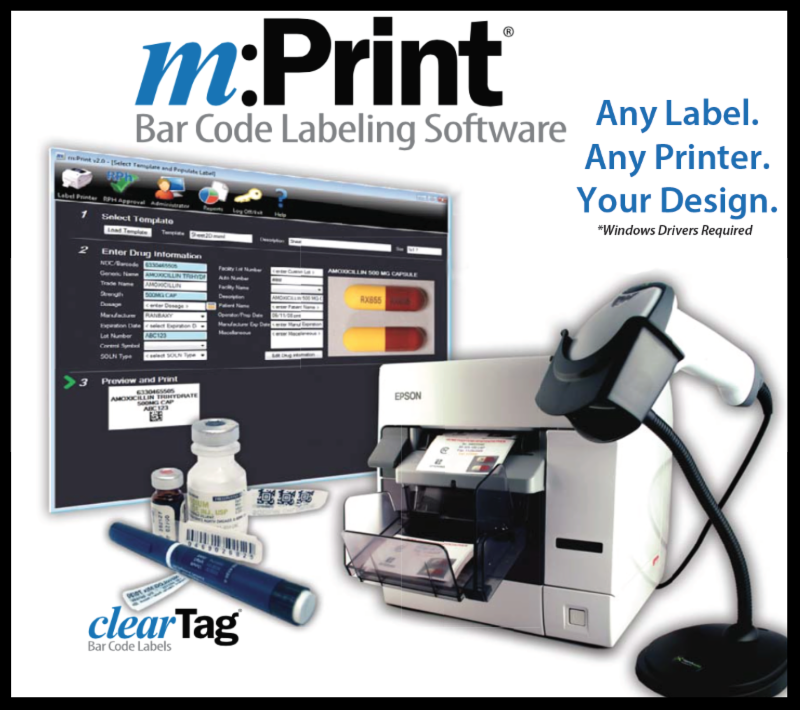 Print any type or size of label using m:Print® Bar Code Labeling Software to any Windows® driven printer, including clearTag® labels for all your hard to label pharmacy items such as vials, ampoules, and syringes. Your bar code and labeling options are endless with m:Print® Bar Code Labeling Software. Any Label. Any Size. Any Printer. The best just got better. Rebuilt from the ground up, m:Print® represents a leap forward in the state of the art. From usability enhancements to new patient safety features, the m:Print® v3.9.1 is set to address all of your unit dose barcoding needs. Medi-Span Drug Database – Complete NDC database with over 100,000 drugs, 50,000 pill images, and tallMAN lettering. Any Label. Any Printer. – If you can design it, m:Print® will print it on any Windows® supported printer. Custom Label Templates – Design unlimited custom label templates for roll, sheet, and flag labels with a few clicks of a mouse. Enhance Patient Safety – With features such as included tallMAN lettering and over 50,000 pill images, m:Print® helps healthcare staff eliminate medication errors. Bar Code Constructor Module – Build a bar code on a label template containing data from one or more data fields and custom selected field delimiters. 2-D Bar Codes – Included support for Data Matrix, Aztec, as well as most popular linear bar codes. Flexible Reporting – Microsoft SQL Server Reporting Services means robust reports with advanced data filtering capabilities. Microsoft SQL Server – Robust enterprise-class database makes sure your data stays secure and safe. The only stand alone bar code printing software specifically designed for pharmacies. 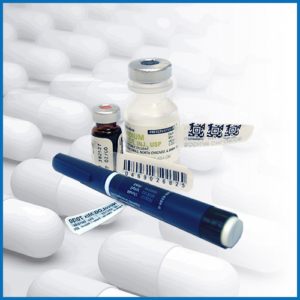 Scan and print features allow the user to retrieve label templates and all drug specific label information by simply scanning the stock bottle.Using m:Print increases label accuracy and helps prevent errors. m:Print® eliminates the need for handwritten user logs and provides a comprehensive database of all packaging runs. On-screen pharmacist approval or rejection of labels. “Scan and Print” Label Wizard to instantly and accurately populate all drug-specific label information. 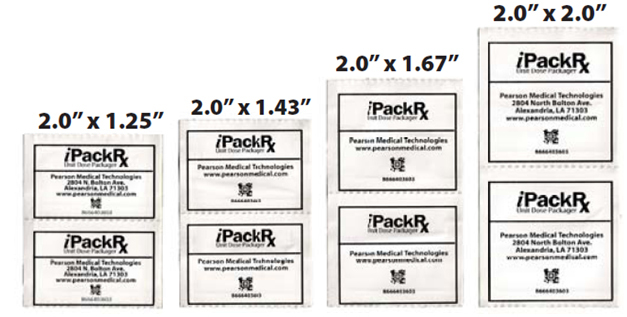 Not only can external labels be printed for all of your pharmacy needs, m:Print® Bar Code Labeling Software can print 4 different size labels for bar code unit dose packaging with the iPack® Rx. m:Print® Bar Code Labeling Software is the operating system of the iPack® Rx and grants your pharmacy bar code and labeling flexibility. m:Print® Bar Code Labeling Software allows every pharmacy to increase efficiency and accuracy of its unit dose labeling. Print any label with 2-D or Linear bar codes. Q: What is included with the purchase of m:Print® purchase? m:Print® Bar Code Label Printing Software includes the software and security key. The purchase of a bar code reader or printer is optional. Q: I already have a packaging system, but my current packager cannot print bar code labels for exception items like syringes, vials, suture kits. Can I add m:Print® to my packaging process? Yes. Because m:Print® is a stand-alone software, that does not require integration into your pharmacy system, you can use m:Print® with any packaging system. m:Print® works independently and can be set up on any windows based computer. Q: Do I have to use a certain printer with m:Print? No. m:Print® works with any printer that uses Windows® print drivers. Q: What types of bar codes can m:Print® print? m:Print® can print linear bar codes like 128A, 128B, 128C, 2 of 5, 3 of 9 and other linear bar codes. m:Print® can also produce 2-D bar codes like Aztec, Datamatrix, RSS. Q: Can m:Print® print bar codes on sheet labels? Yes. m:Print® can print on any sheet labels with any deskjet or inkjet printer. Q: I use sheet labels and sometimes I use labels on rolls. Can m:Print® work with both types of labels? Yes. m:Print® can print to one or many printers in your pharmacy. m:Print® can print to networked computers in other rooms. Q: Can I still use m:Print® when my packager is down for service? The alternate printer will work with or without the packager working. If a software issue occurs, our team of engineers and programmers will replace or send updates to you immediately to assist with any software issues. Q: Will m:Print® allow me to preset my own expiration dates? Yes. The software administrator can set an unlimited number of expiration dates in numerous configurations: mm/dd/yy; mm/yyyy; 24 hours; 7 days; 6 mos; 1 year. Q: Can facility-generated synonyms be used as the unique identifier for each drug rather than the NDC number? Yes. The facility needs to provide that information to our programmers and we will perform the conversion. Q: Can the information in the reports section be exported to another program to study the data? The reports can be exported into a PDF or Excel spreadsheet. When exported into Excel, data can then be sorted and studied for trends up to your discretion. Q: If other bar coded information is available, can it be scanned and input into the fields other than the NDC field? Simply click in the required field and scan the bar code. The information will be populated in the field. Q: Does m:Print® convert from 10 digit to 11 digit NDC? m:Print® allows the use of either a 10 digit NDC or an 11 digit NDC. Q: Can users add images? Yes. Only an administrator has the ability to add or edit drug information. Q: Can the end user create and save facility-specific reports? This feature is slated for a future release. Q: Are users forced to periodically change their user name and password? Q: Are inactive user names and passwords disabled after a defined period of time? Q: Is technical support available with m:Print®? Technical support is available 24/7 for m:Print® users through the Customer Support Agreement (CSA) which is renewable on a yearly basis. Q: Do I receive updates to m:Print®? As long as your CSA is active, you will receive updates and upgrades to m:Print® as they become available. Q: Do I receive updates to the NDC database? As long as your CSA is active, you will receive quarterly updates to your NDC database which includes updates to the NDC database and the drug image database.